Yesterday I wrote about adrenal fatigue. I explained that dietary modifications – really, adopting a natural whole foods diet bursting with nutrition – can significantly help you along the road to recovery. Since I enjoy a breakfast smoothie now and then daily, and have a ready supply of luscious elixirs to pull out from under my hat, let me present you with this tasty, adrenal gland-supporting concoction. This particular morning how-do-you-do will help launch you into your day. Note that when you are battling adrenal fatigue, it is ever-more important to have breakfast within an hour of rising (preferably less!) to stabilize blood sugar and provide brain fuel for starting the day. Protein is especially important for those with low adrenal function – you will see I’ve added a scoop of high quality protein powder. I’ve also kept the fruit content low, and emphasized low-glycemic-index fruit in order to avoid a blood glucose spike. The leafy greens, celery and cinnamon will help to offset the blood sugar impact of the fruit. 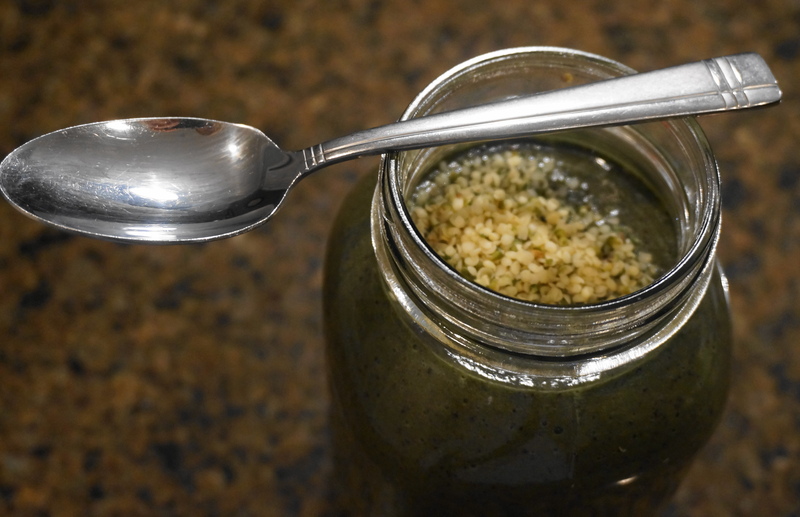 Blend all ingredients, except for hemp hearts. Pour into large glass or mason jar; sprinkle hemp hearts over top. Enjoy…use a spoon, if needed!